Now you can purchase extra top insurance (excuding personal injury cover) from the car hire rental company but as in the example here, you can see that you are looking at an additional £20.76 a day which for a two week rental amounts to an extra £290.67 Compare that to our cover which comes in at a flat £1.99 a day. Thats only £27.86 for two weeks cover in Europe and a saving of over £260.00! See below for the full levels of cover of our cover. Image sourced from Google: Labelled for reuse with modification. Excess reimbursement: Covers for any physical loss or damage to the rental vehicle for which you are responsible. This includes loss or damage to windscreens or windows, roof, tyres and the under body, fire, theft, vandalism and loss of use of the rental vehicle. Includes £500 towing costs. Damage cover: Damage not included within CDW cover-We will reimburse you for any costs you have to pay for: • the repair, replacement and ﬁtting of the windshield or glass on the Rental Vehicle if it is accidentally damaged or broken; • the repair of light damage to the Rental Vehicle, including chips, cracks; or • the repair of accidental damage to the roof or undercarriage. Wheels and Tyres: We will reimburse you for any costs you have to pay for: • The repair or replacement of any wheels or tyres that are damaged as a result of a puncture to the Rental Vehicles wheels or tyres. Rental Key Cover We will reimburse you for any costs you have to pay for : • replacing a lost or stolen rental vehicle key (including locksmith charges and key delivery costs). Please note that you are not covered for any costs incurred in relation to any replacement locks. You must follow the guidelines prescribed by the rental company. Personal Possessions: If your personal possessions are damaged as a result of an accident involving the Rental Vehicle or are lost as a result of the theft of the Rental Vehicle, we will pay for the cost of their repair or replacement. Hired Items: We will reimburse you for any costs you have to pay for the theft or damage to additional hire items which are hired as part of the Vehicle Rental Agreement including: • GPS, • child seats & • toll passes. Roadside Assistance: If the Rental Vehicle is damaged and cannot be driven as a result of an accident or misfuelling, we will reimburse you the cost of call-out, towing, up to one hour’s labour costs at the roadside and the reasonable cost of an international telephone call necessary to: • make the vehicle roadworthy or to transport it to a local garage for repair. Accommodation: You are covered up to the amount shown in the Beneﬁts Table for any Emergency Accommodation & Transport charges you incur when your vehicle cannot be safely driven home after being damaged or stolen, this includes cost of local overnight hotel accommodation while you wait for repairs to be completed. 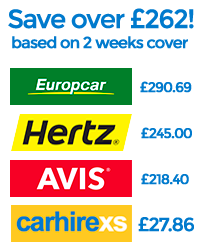 Administration: We will reimburse you for any costs reasonably charged by the Car Hire Company which are associated with them processing your claim for damage to the Rental Vehicle following an accident. These costs include, but are not limited to, handling fees, carriage fees, postal fees, collision fees, administration fees or anything of a similar nature. Drop off / Relocation: You are covered for any drop off charges you incur in the event of an accident that necessitates the relocation of a vehicle from the accident site, depot or towing destination, to another destination chosen by the rental company at their discretion.